We “LexusSpout” are amongst the prominent manufacturers and suppliers of qualitative range of Spout Caps, which are manufactured by utilizing high quality materials and latest techniques. Being a quality oriented organization, we carry out various tests at different stages to assure the quality and design of our range of spout caps. We offer our plastic spout caps in different sizes, shapes and colours as per the requirements of clients and they are accessible at the most affordable prices within the market. Our huge infrastructure is resourced with all the required amenities. Our infrastructural base includes well-equipped units like manufacturing, quality testing, sales & marketing and transportation and all the units are handled by our highly professional team. All the raw materials that are utilized for manufacturing our spout caps are thoroughly checked before fabrication process. Moreover, our final range is also checked before dispatching them to our clients. We have been providing an enormous assortment of plastic spout caps which have useful for several industrial applications like chemical, pharmaceutical, automotive industry, personal care, cosmetics, food and beverages, detergent packaging and many others. We are capable to provide our products on urgent requirements. Moreover, we also have a logistics support system that works on the principle of on-time delivery. Due to these unmatched characteristics, we would be the best choice for our clients. Besides our durable spout caps, we also manufacture and supply excellent quality and innovative spout pouches. We offer our convenient and leakage proof spouted stand up pouches with stock and custom printed selections as per the requirements of our clients. 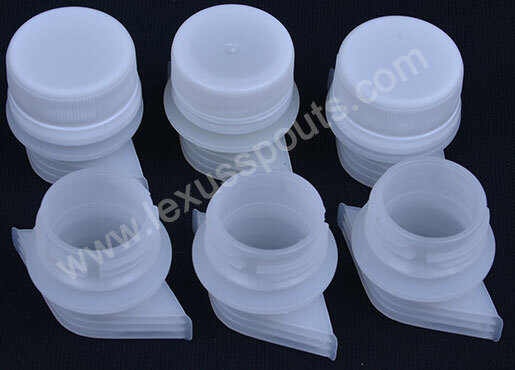 Our plastic spout caps are also referred as child proof caps, HDPE caps, drinking bottle caps, PET bottle caps, plastic oil spouts, beverage caps and several others. For more information about Spout Caps please fill our Inquiry Form. We have positioned ourselves as one of the prominent manufacturers and suppliers of a wide range of plastic spout caps, which are also referred as child proof caps, HDPE caps, drinking bottle caps, PET bottle caps, plastic oil spouts, beverage caps and several others. Lexus Plast Company USA is unaffiliated with cheer pack North America and Gualapack S.p.A. Copyright © 2015 l www.lexusspouts.com. All rights reserved.